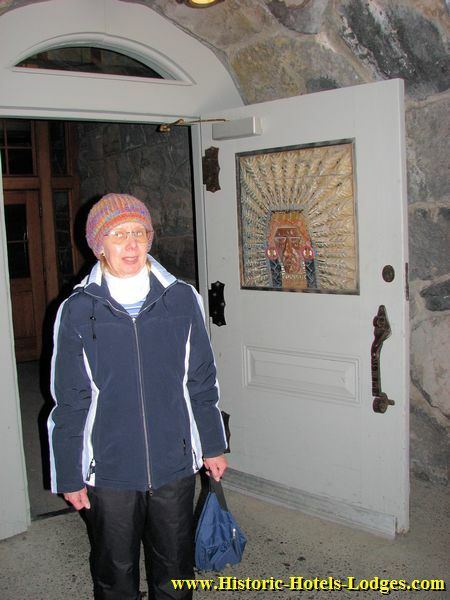 Since the lodge is often buried in 20 feet or more of snow and snow slides off the steep roofs, you can't easily or safely walk up to the front doors much of the year. 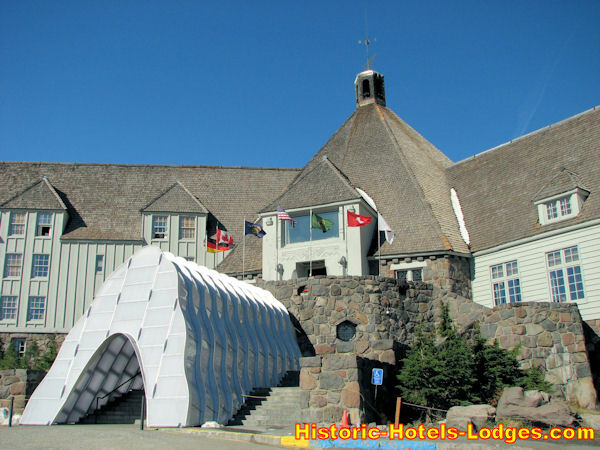 To create a snow-free entrance the white arched structure you see in this photo is erected over the lower entrance to the lodge each year during the snow season. 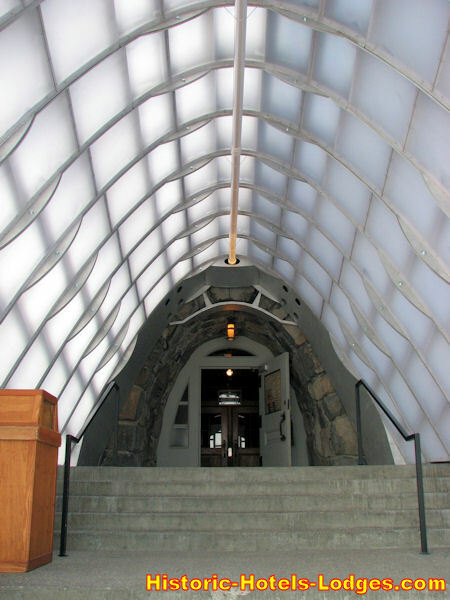 The structure, known as the "snow-cave", creates a tunnel to the lower entrance through the snow. The arched, translucent white cave is designed to blend in with the snow while allowing light to penetrate. You may have noticed that there is almost no snow in this photo! This photo was taken on a later visit than most of the other photos (Oct 6, 2009), just a few days after the brand-new snow cave was erected for the first time. I should point out that there are actually two main entrances to Timberline Lodge. 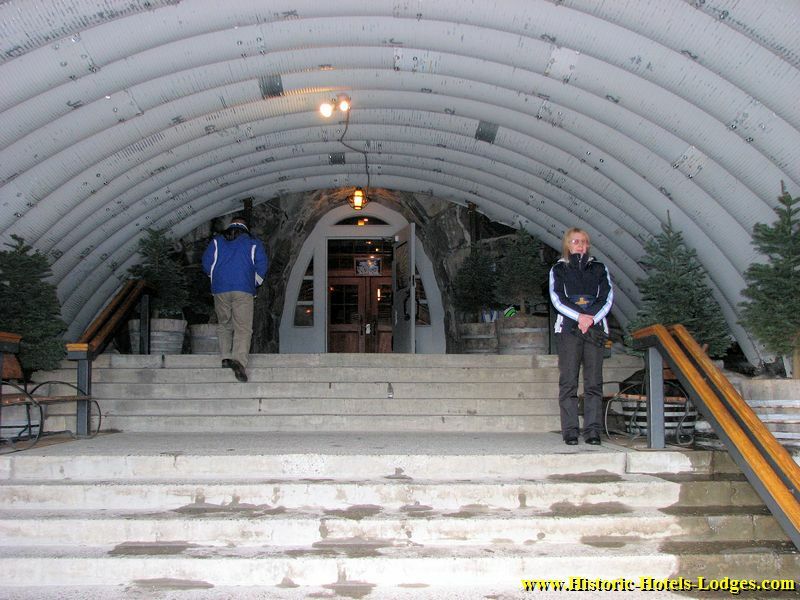 The ground floor door (inside the snow cave) was intended to be the "recreational user's entrance" for skiers or hikers. 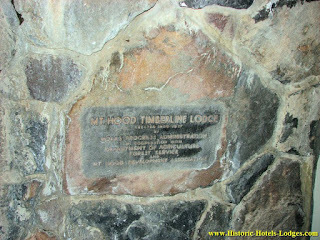 A "grand entrance" on the next floor up was intended for the arriving guests of the Lodge. This separation was a fairly standard arrangement for the time, when people dressed up in their best clothes to travel. Two large sweeping outdoor stone staircases lead up to the grand front door of the lodge on the 1st Floor. One of those staircases is visible to the right of the snow cave in this photo. The grand front door entrance is just behind the flags, below the large picture window. As things work out, people are essentially lazy. 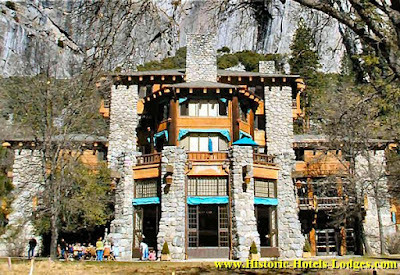 As you can see, you need to climb up a lot of stairs to get to the grand entrance of the Lodge. Given the choice between using the lower entrance and climbing a flight of stairs to reach the main front doors, most folks choose the lower entrance! So on this tour we'll enter the way most folks do, through the lower level recreational user entrance. This is inside the new snow cave. The door standing open at the top of the stairs is the lower, ground floor "recreational user entrance." This photo was taken on my first visit to Timberline. It shows the inside of the old Quonset Hut tunnel that was used as the winter entrance prior to winter 2009. Compare it to the photo of the new snow cave above. 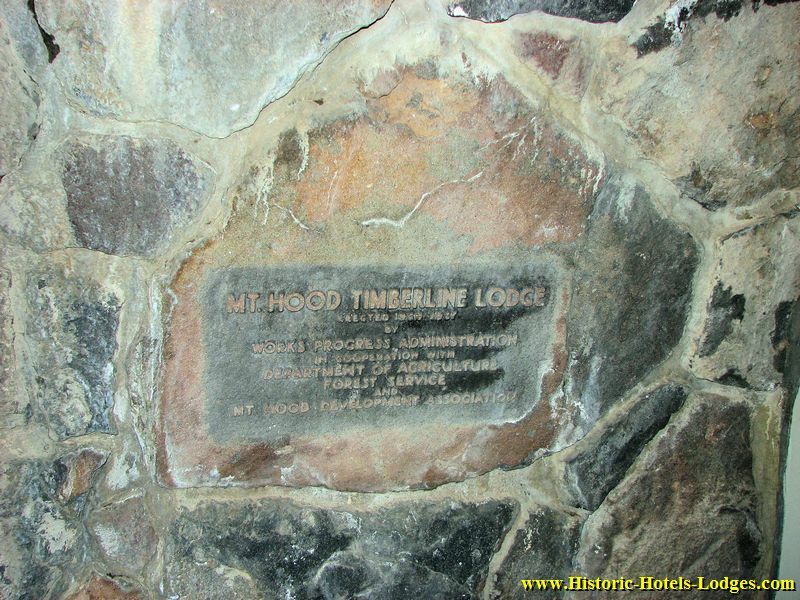 The Timberline Lodge cornerstone: "MT. HOOD TIMBERLINE LODGE ERECTED 1936-1937 BY WORKS PROGRESS ADMINISTRATION IN COOPERATION WITH DEPARTMENT OF AGRICULTURE FOREST SERVICE AND MT. HOOD DEVELOPMENT ASSOCIATION"
The storm door on the ground floor level is called the Indian Head Door, named for the carving set in the door. The other side of the door has the initials of the architects and builders carved in it. Note that the door handle is an arrow. Also check out the hinges. All the hardware for the lodge was custom hand-made for it by WPA workers in a shop in Portland. Behind Julie through the storm door you can see the stained wood double doors leading into the lodge. We've now stepped in through the double doors and are looking directly into the lowest level of the Head House at the center of the lodge. 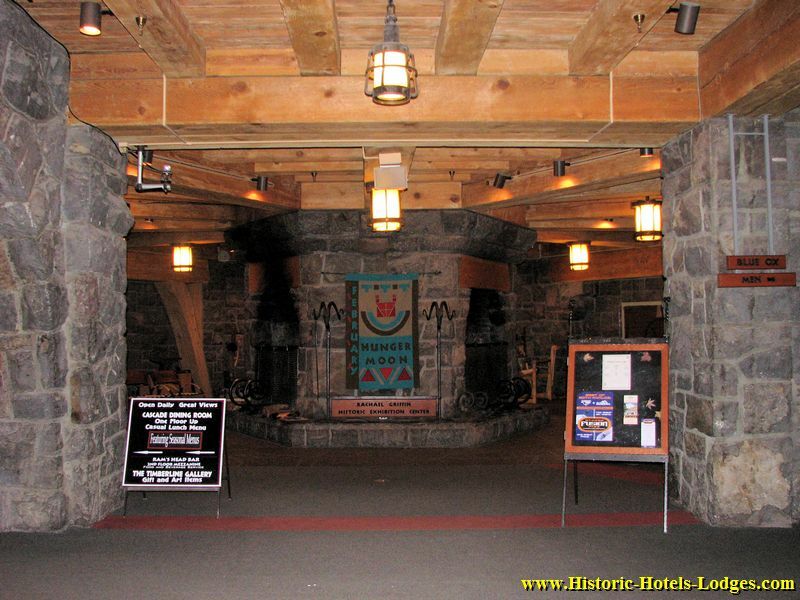 The 6-sided stone chimney at the center of the Head House is directly in front of us, there are 3 fireplaces set into it on this level, two you can see in this photo, the 3rd is on the far side. 3 more fireplaces are up on the 1st floor. 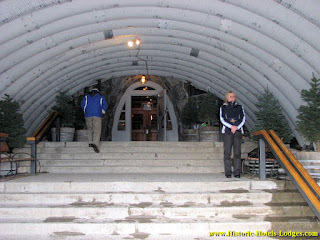 This ground floor was originally the ski lounge, and for years thousands of skiers poured into this lobby. Ski rentals were to the left (in what is now the gift shop), to the right was a coffee shop.